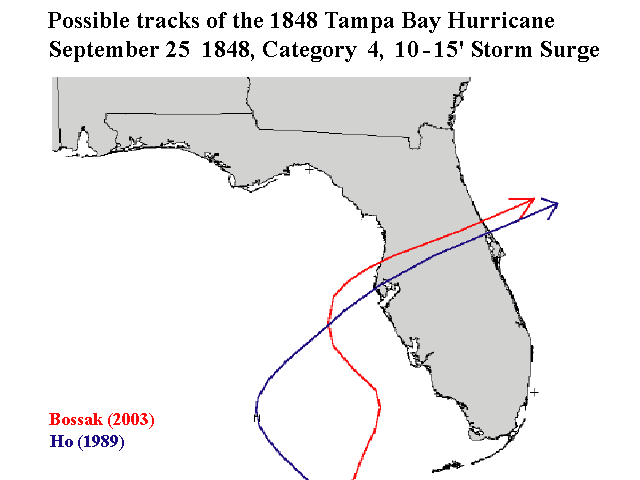 It has been quite a while since a major hurricane has made a direct landfall in the Tampa Bay area but back before the Civil War two hurricanes hit the Tampa Bay area within about 2 weeks of each other. The evening before, the winds began to gust from the northeast with occasional showers. It was reported by residents that the bay “glowed with phosphorescence almost bright enough to read by”. By 9am Monday morning the increasing southeasterly winds began to veer southerly and later southwesterly as the tide rose rapidly and the “wind blew with unprecedented violence”. The violent winds continued through the afternoon only subsiding sometime between 6 and 8 PM that evening. The maximum winds in Tampa (Ft. Brooke) occurred between 1 PM and about 4 PM on the 25th as the wind veered southerly to southwesterly. (1). The barometer at Ft. Brooke fell from 1013mb at 9 PM on the 24th to a minimum of 954mb during the peak of the storm on the afternoon of the 25th. (3) A letter form Maj. R.D. S. Wade at Ft. Brooke stated that “all the wharves and most public buildings at the fort were destroyed and that flooding was exceptionally great but no lives were lost”. The post surgeon reported that the tide rose to 15 ft. above low water and that the “water rose very fast between 1000 and 1400”. It was also reported that all of the vessels in the port were driven up the river and destroyed by the high winds and storm surge. 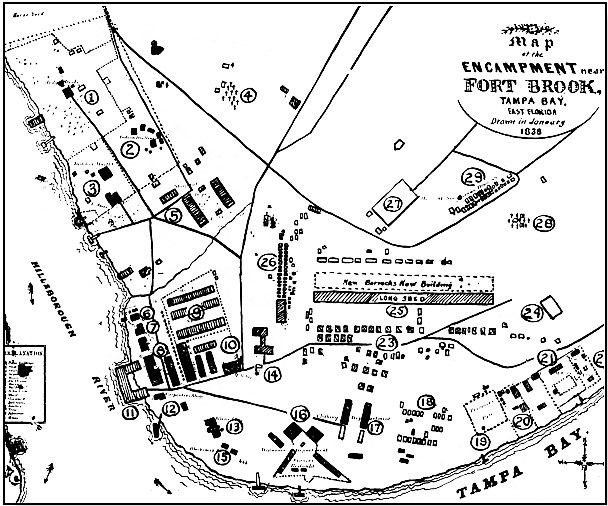 (2) Other accounts stated that great waves covered most of the islands within the bay and that the garrison at Fort Brooke was almost completely inundated by water and waves pounded and destroyed the barracks, horse shed and other structures and only the tops of the trees could be seen. The recently opened lighthouse at Edmont Key was badly damaged and had to be rebuilt. An interesting legend regarding the 1848 Hurricane is that it created a new pass through a barrier island which was discovered by a reformed pirate named John Levique. Today the pass is known as John’s Pass. Ludlum, David M. Early American Hurricanes 1492-1870, American Meteorological Society. 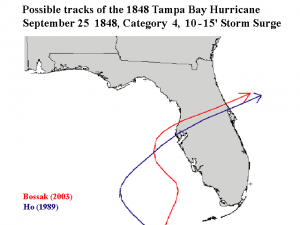 Ho, F. P. (1989), Extreme Hurricanes in the Nineteenth Century, NOAA Tech. Memo. NWS HYDRO-43, 134 pp., National Oceanic & Atmospheric Administration, Washington, D.C. This entry was posted in Ocean Storms, Tropical Cyclones, Weather History and tagged Great Tampa Gale of 48, Gulf of Mexico, Hurricane, North Atlantic, Ocean Weather, Tropical Cyclone. Bookmark the permalink.